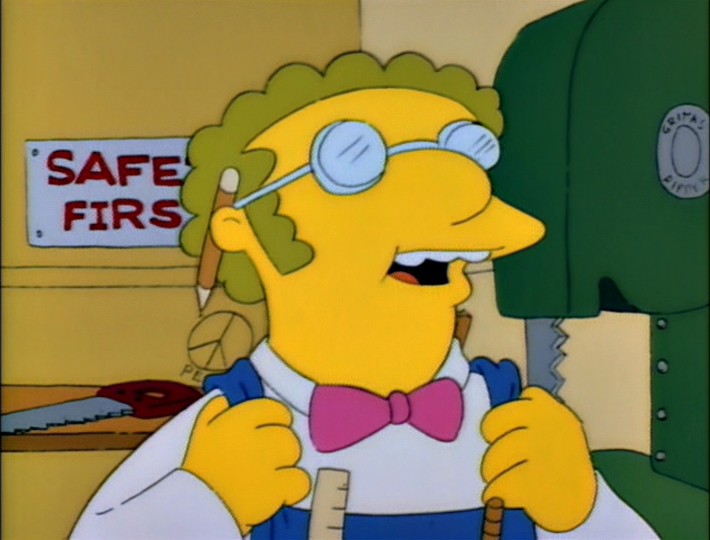 Mr. Seckofsky was the shop teacher at Springfield High School when Homer and Marge Simpson attended the school. He is missing his middle right finger. He have Homer Simpson in four years and give him all the time grade C.
Homer and Barney Gumble skipped his class once while smoking in the toilets, but were caught by Principal Dondelinger and ended up with three days detention. It was here that Homer met Marge for the second time (the first being at Camp Land-A-Man, though they did not realize it at the time). Marge also went to him for a character reference. Modified on October 8, 2014, at 20:54.